Quran Explorer, #AddAFemaleReciter: Jerusha Lamptey wants more women’s voices in Quran reading. 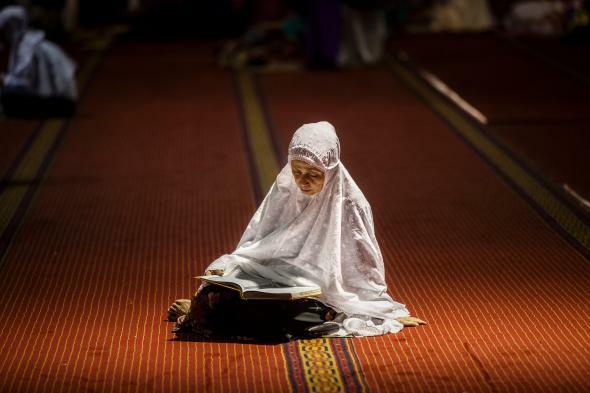 An Indonesian Muslim woman reads the Quran during Tarawih prayers at Istiqlal Mosque on June 28, 2014, in Jakarta, Indonesia. When Jerusha Lamptey listens to the Quran, she usually does it through Quran Explorer, one of her favorite apps. Reading from the holy text in the famously hypnotic and mesmerizing chant involves lots of rules—rules that dictate the ways words are pronounced and the rhythm of the recitation. Known as Tajweed, these rules are difficult to learn, and not all Muslims know them—which is why, in addition to recitations at mosques, the faithful have multiple apps to choose from. There’s just one problem: None of the apps has any female reciters. On Ramadan—which began on June 17 and continues for 30 days—Muslims read from the Quran each evening during the optional Tarawih prayers. The holy text is divided into 30 sections so that it can be finished in its entirety over the course of the month. Listening to it every night, Lamptey, an assistant professor of Islam and ministry at Union Theological Seminary in New York, realized female reciters were missing. She has been tweeting about this stark lacuna with the hashtag #AddAFemaleReciter. Despite the app’s lack of women, she likes the quality of the recitations and the ability to highlight passages and search for words, which is why she recommends Quran Explorer to students and fellow Muslims—and why she wants them to do better. And many aren’t. Two years ago, Tahera Ahmad, a female chaplain at Northwestern University, recited from the Quran at the annual conference of the Islamic Society of North America, the largest umbrella organization for American Muslims. And earlier this year, women in Los Angeles opened the first female-only mosque in America. Although the number of people who have signed Lamptey’s online petition may seem small, it’s indicative of larger trends—and not just in Islam. A group of Jewish women known as Women of the Wall are also pushing to be able to read from their holiest text, the Torah. Though many denominations permit women to read from the Torah, the group that rules the Western Wall, which many consider to be Judaism’s holiest site, forbids it, forcing these women to sneak in tiny Torahs and magnifying glasses. And last year, Rev. Libby Lane became the first female bishop in the Church of England. Women are increasingly taking stronger and higher positions in their religions, so it’s not surprising that they want to participate in equal ways. These criticisms are from a place of love—love of tradition or the religion. Her attitude is encouraging—as is the response from the company behind Quran Explorer, which didn’t say no to the possibility of female readers and asked for examples to consider. (They didn’t respond to my request for comment, but have responded to other people on Twitter saying the issue was under review.) While Lamptey continues the petition, there’s no bitterness in her voice; she just wants them to do better.